This year we spent a magical Christmas in France with our daughter, hubby (SIL) and adorable baby granddaughter. The night before we arrived a heavy fall of snow transformed the surrounding countryside into a magical white world which set the scene for the perfect “White” Christmas. Their home was also transformed with an array of Christmassy decorations including a huge Christmas tree with twinkling fairy lights, glittering gold tinsel and red shiny glass baubles. Our baby granddaughter captivated by the tree, squealed with delight when I allowed her to “gently” touch one of the shiny decorations. The wood burner, although temperamental, also added to the overall ambience especially when you looked outside at the snow and then felt the warmth within. Hypnotised by the fire I watched the dancing flames as the wood glowed in the hearth and I felt at peace. Late one murky afternoon as the snow turned to drizzle we went in search of Santa (Father Christmas) in a nearby town. When we finally tracked him down he was so errrr… words fail me errrr strange Mr. Piglet could not bear to watch for fear he would burst out laughing. Santa’s Grotto consisted of an old bench on the pavement with straw and wood cuttings strewn on the ground for effect. It actually looked more like left-over props from a Nativity scene than Santa’s Grotto. Santa seemed ill at ease with his role and paced up and down the road, nervously clutching his umbrella. In fact, he appeared totally disinterested and hardly the jolly “Ho Ho Ho” Santa I remembered from our children’s Santa days. Even his dishevelled costume looked somehow out-of-place. 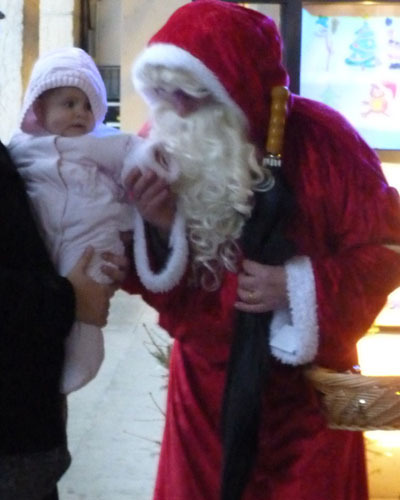 However, to be fair I’ve never seen a “French” Santa Claus before so had no frame of reference as to the norm in France. Perhaps this was normal? His side-kick “Santa’s Elf”, as I named him, sported an impressive camera and tried in vain to sell photo opportunities with “Santa”. We went armed with our own camera and pretended not to understand when he thrust a ticket in our direction while jabbering at us in French. This was a “lost in translation” bonus as we shrugged our shoulders, smiled and continued to take photos. Baby granddaughter looked slightly puzzled but smiled right on cue when she saw the camera. She loves having her photo taken! The Santa encounter although a little bizarre is still one of my treasured memories. Christmas day dawned to a clear blue sky and brilliant sunshine, but no snow. We were all up and dressed early eager to open the pile of neatly wrapped presents under the Christmas tree. As this was our granddaughter’s first Christmas we were pleased to share the special moment as she carefully picked off the colourful wrapping paper to reveal the wonderful surprises within. Initially she was more fascinated by the paper and labels than the present itself. However, she soon realized the prize was not the paper and became increasingly excited the more presents she unwrapped. As I sat back and watched our granddaughter surrounded by all her wonderful presents my thoughts turned to all the children in the world who have nothing and to whom Christmas is just another day and it made me feel sad. I thought of our children and now their children and wanted to hug them all. Christmas should not be about receiving expensive gifts but more about sharing and family. Has Christmas become too commercialized with the true meaning of Christmas lost as we become overly obsessed with buying expensive presents? Strangely enough, apart from her Jumperoo, it was the simplest presents such as building cups, a talking book and a little bear with enormous eyes which seemed to give her pleasure. Our main Christmas celebration was held on Christmas day at lunchtime rather than the more French traditional Christmas Eve, evening. I much preferred this idea as last time we spent Christmas in France the meal started at 9pm and finally finished around 3am in the morning by which time, as you can imagine, I’d lost the will to live. Four families sat down to Christmas lunch, each responsible for preparing and serving one course. Our contribution was the apéritif plus champagne. You may think this was simple – wrong! The more we discussed our catering ideas with our daughter the more we realised it was not just nuts, crisps and sausage rolls. No, this had to be a full-blown gastronomic manicured experience to Michelin star standard. Our daughter raised her eyes heavenwards, praying I think for divine intervention at some of our suggestions. OK, so what’s wrong with cheese and pineapple on sticks? Anyway, by the time Mr. Piglet and I went on a grand tour of the supermarket looking for inspiration, I was a nervous wreck! We were determined not to let the “English” side down. The guests arrived Christmas morning bearing trays of exquisite chocolates, salmon, terrain (similar to pâté but far more sophisticated), more chocolates and a host of other mouth-watering offerings plus very good wines to pair with each course. While waiting for all the guests to arrive and settle (a long drawn out process in France) we were asked to serve coffee. The exquisite tray of chocolates provided by SIL’s mother were opened and then I spotted my daughter had plated up the sweet mincemeat slices I’d made the previous day. I was mortified. 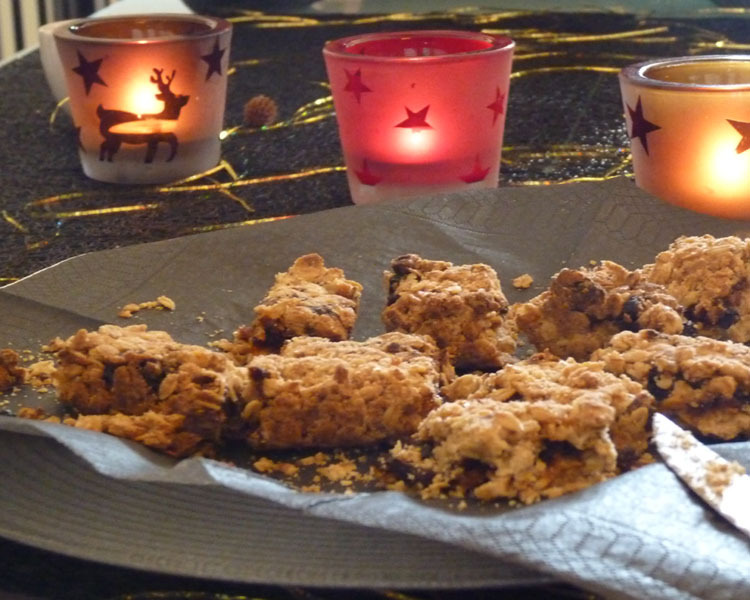 Problems with the oven meant they were overcooked resulting in tasteless dry solid teeth breaking squares of oatmeal. They only escaped the dustbin because I can’t abide to waste food. My oat slices were hardly five star cuisine! So there they were in pride of place on the table. I could have cried. They certainly lacked the finesse of the handmade French chocolates and looked about as appetising as a dried up bowl of porridge. Before I could utter a word of protest they were offered to the “Frenchies” as “traditionally” English. I groaned inwardly “Beam me up Scottie!” They nodded and smiled politely but their body language spoke volumes! I prayed they had good dental cover as they chewed on my oatmeal bullets. Finally everyone arrived and it was time to serve tray after tray of dainty aperitifs and copious amounts of champagne. At least apart from my home-made sausage rolls everything else was French and less rustic. Two hours later we finally sat down for Christmas lunch. The rest of the day was a blur of excellent food, wine and more food PLUS even more chocolate for dessert. I think the French are definitely chocoholics. I am not sure what to make of “French” Christmas lunch other than that while we really enjoyed it, we felt completely alien as though we were outsiders looking in. Language proved to be a big problem and we felt isolated; observers rather than full participants. This made the ten-hour lunch rather surreal almost like sitting at the movies watching a good French film, but without the benefit of English subtitles. Thank goodness our baby granddaughter still converses in smiles and baby coos. However, as I looked at her I felt lost knowing it will only be a matter of time before we will become the grandparents who speak in that “funny” language. People say language submersion is the best way to learn so I am already scouring Ebay and Amazon to order an English/French dictionary before my next encounter! On our last but one day in France we went to a family resort in the mountains near Saint Pierre de Chartreuse. The gentle snow-covered slopes were a hive of activity. 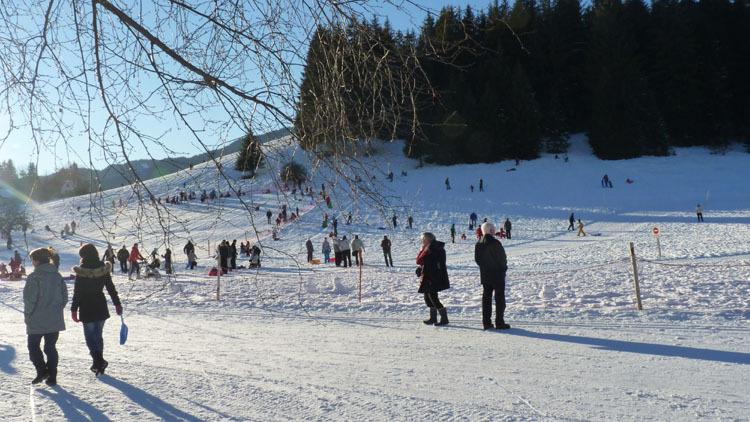 Not with skiers but with people sledging, cross-country skiers and walkers wearing special snow shoes. Fascinated, I studied the assortment of sledges amazed they came in so many different shapes and sizes (I’ve obviously led a sheltered life). However, I was absolutely delighted to see it was not just children who were whizzing down the slopes, but adults too. I can’t wait to return with a sledge and snow shoes. Yay! What a great Christmas…but we miss our family already! I also had a great Christmas! Home-made sausage rolls and mincemeat slices will beat shop bough choccies anyway in my book Mum! Am glad you had a great Christmas and don’t forget I speak that funny language too! Yes, we had a very special Christmas 🙂 Thank you! I love to read how others spent their Christmas. Also agree with you, eating late on Christmas Eve would make me useless the next day. The French really know how to enjoy their food but to us Brits Christmas lunch is a tradition :-). Wishing you and yours a very happy 2012.
the French are reall foodies! I don’t think us Brits could make lunch last 10 hours! So glad you had a wonderful Christmas PiP. We used to do a Christmas Eve dinner and just have finger food on Christmas Day. When we started spending Christmas here at the beach, we started having an early afternoon Christmas dinner. It’s so much nicer! Have a happy and prosperous 2012! I agree, much prefer eating a large meal at lunchtime, especailly at Christmas. Sounds like a lovely Christmas – I miss snow at Christmas and the traditional Christmas lunch. Here in the Dom Rep the big meal is Christmas eve but no presents at all until Kings Day on 6th January!! As a child I could hardly wait until after breakfast to open my presents , let alone 2 weeks! Two weeks before you can open presents! Snow always makes Crhistmas seem more Christmassy, but in reality it’s a flipping nuisance when you have to travel. Sounds like you had a wonderful Christmas. It is a time for families, n’est-ce pas? I had to laugh at your description of the Christmas meal. My daughter (who has a French partner and has been living in France for 2 years) was telling me all about the various traditional foods they serve at Christmas eve and Christmas lunch…just so many…and I thought the Portuguese had a big Christmas food variety. I can just imagine myself in the same predicament in a couple of years, as apart from my daughter´s partner, his family doesn´t speak English at all – and my French was learned at school many years ago, so almost non-existent by now. So sign language might be useful! Happy New Year to you and your family. Have a good one! Baby P is beautiful, but then I’m biased! So glad you were able to share your granddaughter’s first Christmas. And that plate of chocolates looks . . . YUMMMMMMY. The bottom photo of your granddaughter is SPLENDID. I don’t remember seeing it when I commented initially. She’s gorgeous! Of course it is eaeisr to visit other countries from Portugal than from Malta. In December we have winter in all of Europe and the temperatures will not increase 15b0C or 59b0F as average at noon.To get a visa is as easy for both countries. You just need to provide proof of ties to your country and meet the general visa requirement.Never try to apply for a visa for 90 days if you only have the financial means to stay for 30 days, you can be sure that your application will be rejected. I could have told you more if you would have told your citizenship with your question. Happy New Year, PiP! Piglet-ette is adorable. What a smile!! Oooh she is and she is such a character as well. I love her to bits 🙂 Hope you had a great Christmas in NY? A ten-hour lunch! You must really have to know how to pace yourself when eating that way. It all sounds delicious and beautiful and festive. How wonderful to be able to share your granddaughter’s first Christmas. She’s adorable! Hi TT, pace myself LOL 🙂 The French can talk and talk. What a nice photo and how you spend the holidays. ~faints dead away~ I could not phrased it better. 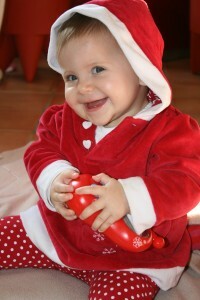 Her first Christmas was so special, I am just glad we were there to share it – she is SO adorable! Thanks Jake and HNY 2012 to you! What fun to read about your family Christmas and the marathon lunch! As always, your capacity to make fun and laugh at yourself and the situations you find yourself in make me smile. That granddaughter of yours is beautiful. A belated Merry Christmas (if I haven’t wished you one already), and very best wishes for the new year, PiP. I am pleased my dry humour comes across in my posts. 🙂 I try hard to laugh at situations such as these otherwise I would cry 🙂 You have to look at the funnyside of life. Best wishes for the New Year…and hope to read you will soon be moving in to your new house in the woods! I love that last photo – what an absolute poppet she is! the last photo makes me smile every time I look at it! Excellent description of the French!!! Your grandbaby is adorable. What beautiful pictures! It must have been magical to have the family all together. Your granddaughter is just beautiful!! Wonderful memories and beautiful pictures… ♥HAPPY NEW YEAR 🙂 ! This sounds like great fun. I’m so glad you were able to be with your adorable little granddaughter. Our 1-year-old grandson was here for four days with my son and daughter-in-law. So much fun. And so sad, silent and empty when they leave. The babies occupy your awareness so intensely while you’re with them that it takes a while to adjust once they’re gone. Here’s looking forward to the next time. “…babies occupy your awareness so intensely while you’re with them that it takes a while to adjust once they’re gone. ” That’s it! She filled my day! Mummy piglet said I was her new best toy bercause I loved to play with her. I am glad you also had a great Christmas – it is so specail when children are there. Thank you for sharing your family memories. What a lovely article. Happy New Year to you and your family. Turst me when I say even cream or custard could not disguise these. If this happens again in France i will leave nothing to chance and bin them! Little piglet is so adorable the last photo makes me smile even when I feel sad. What a wonderful time you had! 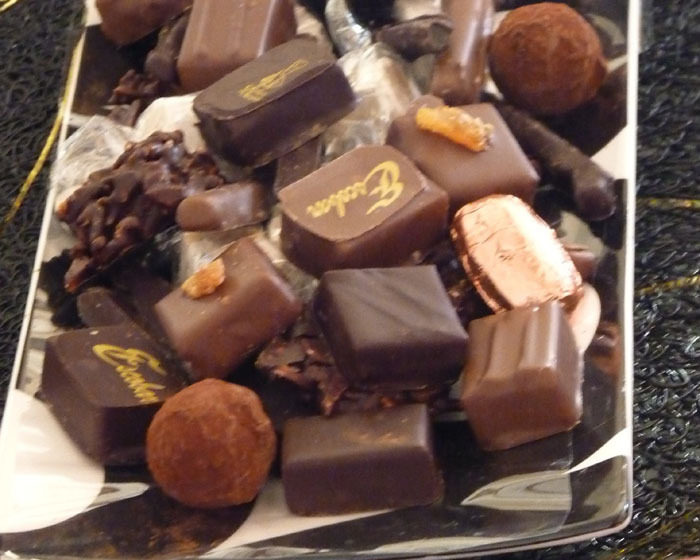 I love those chocolates, but trust me, it is too hot here to even contemplate eating chocolate! Can we have some of that snow please???? I worked through my holidays, that would be Thanksgiving, Christmas and New Years. Today I am off and I am finally able to read about my blog buddies’ fun. I loved yours. It took me to FRANCE. This is a place my daughter dreams of moving to and now I understand why. It looked beautiful through your eyes. Thank you for the adventure. Hi kibble, sorry to read you worked through the festive season. Hope it was not too bad for you? France is a lovely place but you really do need to learn the language. The one thing I’ve noticed about the Frenchis that even when they can speak English, they often don’t or won’t! Other than that it is a lovely country and I would probably move there tomorrow. Stella, daughter, knows how to speak French, thank goodness. She also knows how to speak Japanese and is working on Latin. She is such a show off. 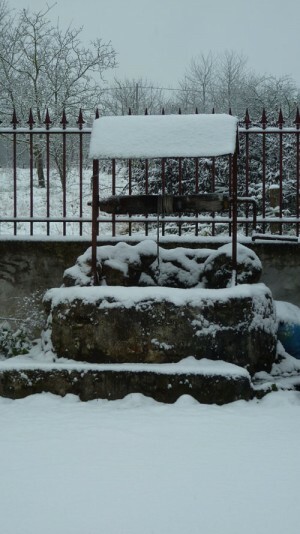 Snow covered France – makes me ache to be there! I encountered Pere Noel or Father Christmas at Galeries Lafayette in Paris looking much like the one you met. Too cool! Much less scary than some American versions I can tell you! I can’t even imagine cooking for the French. What pressure that must have been! But give them enough champagne and all will be forgiven. I hope you have a beautiful 2012 and I look forward to reading about all of your adventures. As for buying and preparing the aperitifs; I was shaking. What a lovely story and how nice you had snow to top off your Christmas. Don’t worry about the language barriers, the main thing is you were there for your daughter and her family. The pictures are fantastic, shame about your bullets though – ouch! So nice to see how your reades reacy to you lovely family story. I am going to be a grandmother for the first time in February. I think I will relate to your story in December 2012. Many good wishes. Your first grandchild is really special – enjoy the moment 🙂 Do you know if it’s a boy or girl? Do you live closeby to your daughter? Thanks Marcia, we certainly had a great time and look forward to our next trip. The language barrier just makes you feel isolated. Thank you for this beautiful trip to France…I haven’t been…but because of you, I’ve experienced a lovely French Christmas. BTW, the grandbaby is precious!!!! I’ve awarded you the Versatile Blogger Award…you deserve it! After reading this, I feel like I’ve just had a beautiful vacation in France ! Love it and what beautiful pictures.